Today is my team's dress alike day, so I created this locket for them to wear at convention. 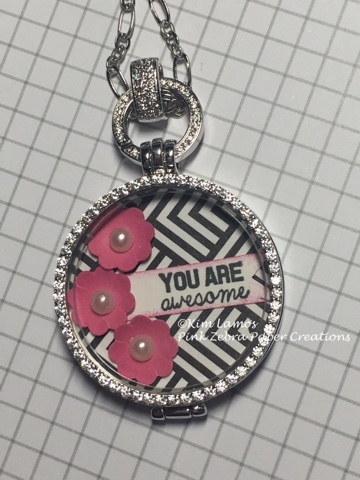 My group is named "Pink Zebra Blooms" so I created a locket that went with our name. The base if the locket is a 1 1/4 in circle punch from the Fun Filled Paper Pack. I then used the Summer Pretties punch to punch from Watermelon Fusion Cardstock the small flowers. I added them to the base. Then I stamped "You are awesome" from the Tag Elements ATS on Whip Cream Cardstock with Black Licorice ink. I used Sweet Berry ink to distress the edges and then added this to the base. To finish it, I added small pearls to the flower centers. Enjoy! Hi Kim, I love all of the journey girl necklace inserts you made but this is my FAVORITE!!!!!! !